The formula SAN Shredded is one which is meant to support the body of the users get lean and eliminate a lot of accumulated water in the body as a pre-contest. The formula is made with some of the beneficial ingredients which are enhancing the elimination of stored water from the body and further enhancing the urinary tract health. In so doing, the supplement could boost their health. High accumulation of water in the body may make one run out of shape and it is this supplement which may return the user into the right shape and weight. Who is the Manufacturer of SAN Shredded? The manufacturer of the supplement is known by the name San Corporation. This is a company which is working tirelessly in order to enhance water loss from the body and accordingly weight loss in a natural manner without harming the body. Electrolyte balance in the body of the users is another concern of the company which is it is striving to achieve for the users to have better support. In so doing, San is relying on natural ingredients which have shown notable support in the betterment of weight loss processes in the body. How Does SAN Shredded Work? The working of San Shredded is following the ingredients which have been selected and included in its formulation. The ingredients in the formula are allowing for better expulsion of excess water from the body. One of the products of respiration is normally water and this supplement has the right ingredients which are picking the water molecules and accelerating their expulsion from the body. In addition to this, the electrolyte balance of the body is maintained with the relevant ingredients. Fat burning is also amplified to continuously generate water in the body and all these are then enhancing the working of the formula. 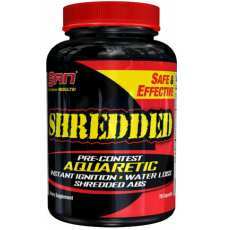 SAN Shredded Ingredients – Are they Safe & Effective? The ingredients which are included in the San Shredded for better weight loss and water elimination include the following. Uva-Ursi – This is fighting off the physique blurring water retention in the body. It may lead to better flushing of water out of the body. Stinging Nettle Root – This is serving the role of preventing the binding of testosterone to SHBG. Since the levels of available testosterone will be enhanced, one may gain better toning of the muscles. Taraxacum Extract – This is cleaning the kidney by supporting waste removal hence better health. Caffeine and Green Tea Extract – These are supporting release of stored fats for energy generation thus better weight loss. There are also other ingredients in the formula such as magnesium stearate, titanium dioxide, microcrystalline cellulose, silicon dioxide. What are the Advantages of SAN Shredded? There may be enhanced weight loss from the body of the users of the supplement. One may notice better water levels in the body hence enhanced health. Toning of the muscles in the body may be enhanced. Challenges which are related to overweight in the body may be lowered. What are the Disadvantages of SAN Shredded? Serving size being 7 capsules is just too much for regular usage as indicated in the label. There might be dehydration of the body following the usage. Those sensitive to caffeine may find the product ineffective. The supplement may be taking longer time for better support in the body. How Should You take SAN Shredded? The serving size of the supplement is said to be 7 capsules. This should be done once daily with about 16 oz water after morning meal. About a gallon of water should be consumed to avoid dehydration. How Much Does SAN Shredded Cost? The price of the supplement according to the official website of the brand is given as $15.97. This does not include the shipping costs. What is SAN Shredded’s Return Policy? There is 30 days return period on supplements which the users find ineffective or unsatisfactory. In case of the wrong product received, one should contact the company for exchange appropriately. Does SAN Shredded Offer a Free Trial? There is no free trial which is being offered on SAN Shredded. One may have to pay for the supplement to make use of it accordingly. Supplement SAN Shredded is one which is serving the role of boosting the weight loss processes by shredding off excess water from the body organs and tissues. It may be booting gaining of better toned muscles and could support enhancement of energy levels. There might also be some support to the attainment of better shape. Nonetheless, some demerits also accompany the formula. To begin with, there is the serving size issue. Consuming 7 capsules per serving appears to be too much of consumption. One may also find it time taking to notice the claimed results while at the same time there could be sensitivity to caffeine in the weight loss supplement which may make some people to consider other available in the market.